He never played a game of baseball until he was a freshman in high school, but his skills blossomed so quickly that he signed a professional contract after his junior year. Only 16, Wally Post started a baseball career that lasted 18 years and saw him transform from a pitcher-first baseman to a hard-hitting, superb fielding outfielder. Walter Charles Post was born in West Central Ohio in Granville Township, Mercer County, on July 9, 1929. Mercer County is on the Ohio-Indiana state line, about midway between Cincinnati and the Michigan state line. Most reference books give the unincorporated community of Wendelin as Wally’s birthplace, but Wally considered the nearby village of St. Henry as his home town. He was the sixth of the nine children of Mary Brunswick and Frank B. Post, a farmer. Before the 1946 season the Cincinnati Reds signed 16-year-old Wally Post to a professional contract. They assigned him to Middletown of the Class D Ohio State League. He lost his only pitching decision that year. The next year he was moved to the Muncie Reds in the same league, and he fared much better. He had a 17-7 (.708) record with a 3.33 ERA. Wally’s brother Eddie was on the same club, the only time the siblings were teammates as professionals. Eddie outdid his kid brother with a 19-8 .704 record and a sparkling 2.02 ERA. Unfortunately, Eddie hurt his arm and never made it to the major leagues. Another teammate on the Muncie squad was Joe Nuxhall, who was known as the youngest player ever to play in a MLB game and later gained fame as a Cincinnati pitcher and even more acclaim as a color commentator on telecasts of Reds games. Both brothers outperformed Nuxhall in 1947, as the future star broke even at seven wins and seven losses. In 1948 Post moved up to the Columbia (South Carolina) Reds in the Class A South Atlantic League and was converted into an outfielder. His future was to be in hitting, not pitching. On January 29, 1949, Post married Dorothy Jean Beckman of St. Henry in her home town. She was the daughter of Lorine Stammen and Luke Beckman, the co-founder and manager of a vegetable canning factory, the Beckman-Gast Company, later known as Minister Canning Company. The marriage lasted until Dorothy’s death on January 18, 1980. Post started the 1949 season in South Carolina, but before the season was over he was transferred to the Charleston Senators in the Class A Central League. After only six games in the West Virginia capital, he was called up to the big leagues. Wally Post made his major-league debut at the age of 20 on September 18, 1949. He entered the game at Crosley Field in the bottom of the ninth inning of a tie game against the Boston Braves. With one out first baseman Ted Kluszewski hit a two-bagger. Danny Litwhiler was intentionally walked. Post was brought in as a pinch runner. He was on base when Virgil Stallcup drove Klu in with the winning run. Wally shuttled back and forth between the majors and the minors for the next three years. Tulsa in 1950, Buffalo and Cincinnati in 1951, Milwaukee and Cincinnati in 1952, Indianapolis and Cincinnati in 1953. In 1954 he started a ten-year stint in the majors, with no demotions to the bushes. In 1956 he hit 36 four-baggers to contribute to Cincinnati’s 221 homers, which tied the record for the most home runs ever hit by a one club in a season. In 1957 Post was one of eight Cincinnati Reds voted by fans as starters in the All-Star Game. Citing voting irregularities, Commissioner Ford Frick removed three of those Reds, including Post, from the team, replacing them with Hank Aaron, Willie Mays, and Stan Musial. Although his long-distance clouting got the most attention, Post was an excellent fielder. In 1954 and again in 1959 he led the National League right fielders in assists; he led in putouts in 1955. He ranked among the top three in assists sixth consecutive years and was among the leading five in putouts in five of those six seasons. On December16, 1957, the Reds traded Post to the Philadelphia Phillies for Harvey Haddix. But after two and a fraction seasons in the City of Brotherly Love, he was back in Cincinnati again. 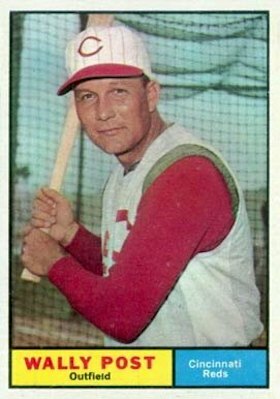 On June 15,1960, he was traded along with minor leaguer Fred Hopke to the Reds in exchange for Tony Gonzalez and Lee Walls. Post must have been thrilled to escape the cellar-dwelling Phillies and return to his home state. Post was back in the Queen City in time to help the Reds win the 1961 National League pennant, their first flag since 1940. That autumn he played in the only World Series of his long professional career. Post appeared in all five games as the Reds lost the Series to the New York Yankees. But he did his part in the losing effort, collecting six hits in 18 times at bat for a .333 average. He hit one home run, batted in two, and scored three. In 1962 Post played in 109 games for the Reds, hitting .263 and clubbing 17 home runs. It was his last productive season. On May 16, 1963, he was sold to the Minnesota Twins, but appeared in only 21 games for the Twins, who released him on October 25. The Cleveland Indians signed him as a free agent on November 15. 1963. In 1964 Post appeared in five games for Cleveland before his major-league career came to an end. His final game came on May 9, 1964 at the age of 34. In the bottom of the sixth inning of a game against the New York Yankees at Cleveland Municipal Stadium, Post pinch-hit for Pedro Ramos. Yankee pitcher Whitey Ford induced him to fly out to right field. One week later the Indians released him, and that was the end of a stellar big-league career. After Cleveland let him go, Post played 27 games for the Syracuse Chiefs, Detroit’s affiliate in the Class AAA International League, but his heralded power was no longer evident. His days as a professional baseball player were over. Dorothy Jean Beckman Post died in St. Henry on January18, 1980. Wally remarried on November 21 in Mercer County to Pat Hauer Cahill. In late 1981 Wally was in and out of hospitals for treatment of cancer. On January 6, 1982 Walter Charles Post died at the home of a son in St. Henry. He was 52 years old – a good man, gone too soon. According to his obituary he was survived by his second wife, four daughters, three sons, and nine grandchildren.10 Some of the survivors very likely were stepchildren. There is a great deal of confusion in accounts of his life, as his first wife was nicknamed Pat, the same as his second wife. 1 Cincinnati Enquirer, June 22, 2003. 5 Cincinnati Enquirer, June 22, 2003. 8 Cincinnati Enquirer, June 22, 2003.